The other day, I noticed a woman – she was bald – and she was beautiful. 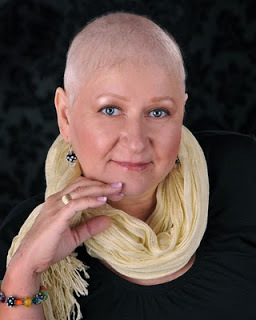 What shone through creating this vision of beauty was her spirit – undaunted by her journey through cancer. She was not going to let cancer define her. Not everyone can allow themselves to be that vulnerable. That’s okay. There are times in the cancer journey when we need to protect ourselves while we heal. And for most of us, this is quite often. Wearing chemo hats and scarves, even real looking wigs, does give us protection – not just our souls, but protection from the environment whether it’s the cold of more northern climates or the heat of southern climates. About being bald, here is a funny story of my time going bald. My hair was just coming back in. It was July in Ontario which means hot and muggy. Way too hot to be wearing scarves or wigs, even a hat, although I did wear it on occasion so I wouldn’t get sunburned. I wore bald plain and simple. At the same time, my Mom had just had a cancerous lesion taken off her top lip. She had stitches and a fat lip to boot. So, we are over at the shopping mall next to my Mom’s apartment – me with no hair and my Mom with a fat lip. The looks we got were totally hilarious – disbelief, shock, a smile. Having a sense of humour makes life so much easier. We laughed about this incident many times. Priceless.